I can promise you, my house will never be divided. 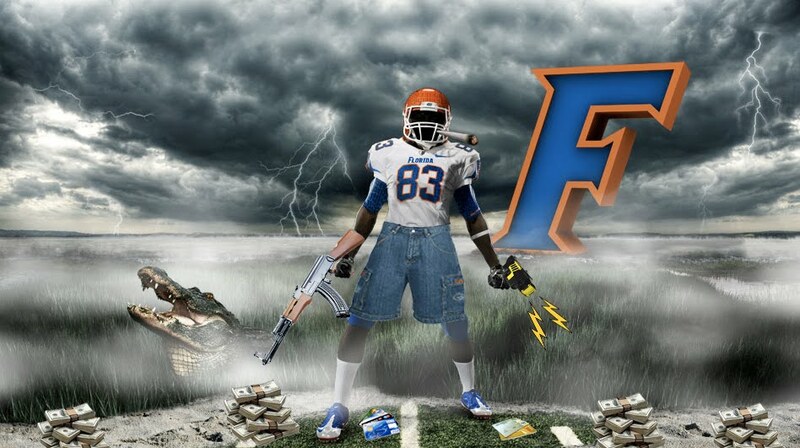 My nephew once asked what I would do if he chose UF to play football, and I can promise you the kid will have an offer and he's only in 8th grade. I gently let him know that I'd make sure that I disowned him, his father (my brother and a huge ND and UGA fan) made sure to let him know he would never fund that decision, and my wife told him that living in the trailer parks in Gainesville were considered "cool". 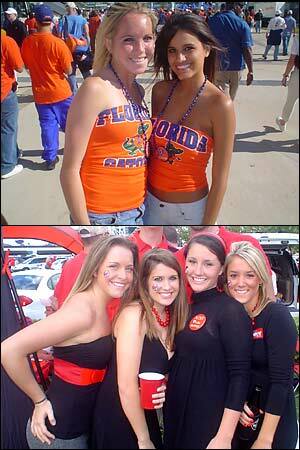 Think we like Florida?!?!? This year is the first in a few the Dawgs are actually favored and the first year in quite a few that I truly believe the boys will come through. Week 9 is here and I honestly had trouble finding the relevant games to pick this week. Regardless, I can live with my 25-10 record, and this week, I'll be 5 - 0. Just for the hell of it, check out the girls of the SEC. Dawgs get it done in Jacksonville. Look, Florida has proven they are not very good. The story is that Brantley isn't have the Saint Tebow was and Meyer isn't a quarter of the man anyone thought he was. Come on, Rainey is coming back?!?!? I believe in 2nd chances, but if he threatened my daughter, court and playing time wouldn't be near the top of his troubles. As "good of a guy" as Meyer claims to be, there is a fine line in screwing up and threatening to kill someone. Domestic violence shouldn't be tolerated and I don't think Chris Rainey is the kind of difference maker UGA lost the first four games in AJ Green. 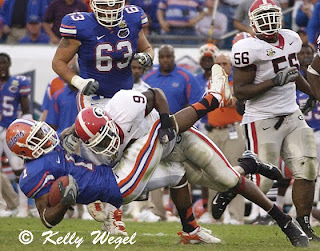 The UF defense looked good, for a minute, but has begun to break, and though Urban Meyer has only lost 3 games in his career after a bye week, I'm not sure that Florida has what it takes to beat a much improved UGA team. Coach Grantham has his defense ready to play, Coach Richt is continuing to coach for his job and Aaron Murray has proven to be by far the better Florida QB between him and Brantley. 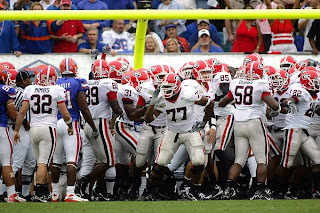 I'm thinking this year will be a good year for UGA and hoping that they will start a new tradition of not losing to UF consistently, ever again. Take the Dawgs to win and cover the spread. I think that the Trojan condom wrapper may have a better chance of containing the highly explosive Oregon offense. I can't disagree with Auburn being the #1 team in the BCS poles, but Oregon deserves any and every honor they get this year. The offense is ridiculous, the defense is talented, and they are coached by someone who means business. Don't get me wrong, the boys of the University of Spoiled Children are talented, but when they lost Pete Carroll, they lost a lot more than a coach. Lame Kiffin does not deserve to coach in the college ranks. He is unloyal, he is unethical, and he has never truly proven to be worthy of a head coaching job. It says something about a coach when his dad has to be around him 24/7 and still can't keep him in line. He screwed up Tennessee for years to come and now he's working on USC too. Sorry Trojan fans for your loss and I hope your AD has the sense to bring in a respectable coach soon to turn the ship around before it's too late. Barkley is going to have a good game, but the Trojans don't score nearly enough to keep up with the Ducks. Ducks easily cover the spread. Look, don't piss those corn fed Iowa boys off, period. Mark Dantonio's team has put together a special season, but the win one for the gipper routine only lasts so long. Iowa is hungry after losing a tough game last week to Wisconsin at home and Ricky Stanzi is out to prove he'll win another big game. The Hawkeyes won't let their fans down like that again at home and the Hawkeyes O and D line should dominate this game. I'm going to take Iowa for the win, but not to cover the spread. 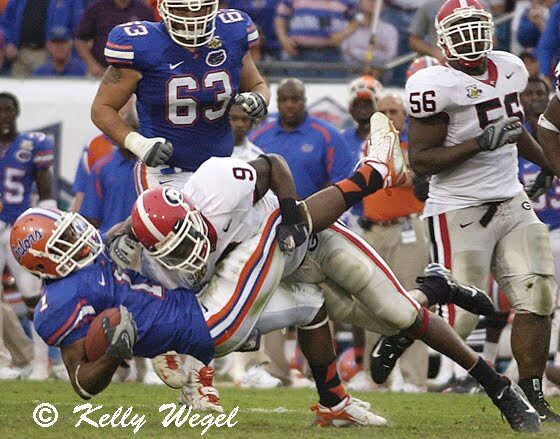 This looks like a hell of a game and I'm not looking forward to missing it while watching UGA stomp Florida. There are always commercial breaks. Iowa wins by 6. With an apology to my family in St. Louis, your undefeated season and hopes for the National Championship end here, if you ever had those hopes at all. Sorry Tiger fans, Nebraska is too good and T-Magic has responded to the criticism. Nebraska is back to being the type of team my father used to brag about when I was a kid. The boys are fast, strong, big, and very good. Huskers beat up on the Tigers and cover the spread. Tulsa may be more than Notre Dame can handle, but after playing awful the last few weeks, I've got to believe the Leprechauns start to turn things around. They are too talented not to, aren't they? Let's hope so. Take Notre Dame buy not the spread. Irish by 7. Via MidWestSportsFan comes the almost dead on Ron Washington Halloween costume. Put a little booger sugar around the nose and fingertips and you got a dead ringer. By the way was it just me or did Vlad Guerrero look like Michael J. Fox competing in a Jenga tournament last night? Vlad made Brooks Conrad look like Ozzie Smith out there. In the first message, timestamped 3:22 p.m., Sullivan wrote, "Gust of wind up to 60mph well today will be fun at work... I guess I've lived long enough :-/." The second message, which was sent at 4:06 p.m., less than an hour before his tragic fall at 4:50 p.m., reads, "Holy f*** holy f*** this is terrifying." I don't know what really to say. I've heard conflicting stories about whether or not he should have been videotaping in the first place when the wind gusts were reaching 40-50 mph in South Bend. I'm not sure who's call it was and I hope people are not so quick to judge and persecute who's fault if any there was in this tragic incident. From what I've heard Declan was a well liked kid who loved Notre Dame football. He will be missed. R.I.P Declan Sullivan. Check out the article at The Leather Helmet Blog (leatherhelmetblog.com) which I find awesome by the way.